The Forks Market and surrounding area of the City of Winnipeg in Manitoba, Canada are highlighted by the yellow glow which spans the sky at sunset. Skyscrapers in the downtown area of the City of Winnipeg in Manitoba, Canada decorate the backdrop as The Forks Market and the park area highlight the foreground along the banks of the Assiniboine River. A glowing sunset spans across the sky outlining the clouds in bright yellow and pink hues. Picture of a beautiful sunset over The Forks Market and surrounding area in the City of Winnipeg in Manitoba, Canada. The Forks sits on 56 acres and has received international awards for the elegant design along the Assiniboine River. 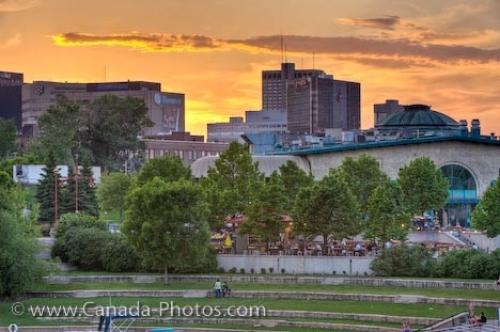 A stunning place to visit while in the City of Winnipeg in Manitoba, Canada with plenty of outdoor areas to watch the sunset take over the summer sky. Sunset over the Market and Marina at The Forks, a National Historic Site in the City of Winnipeg, Manitoba, Canada.